Gordianus, his laureate, draped and cuirassed bust right. Pietas, standing facing, head left, raising both hands. Minted in Rome in the summer of 241 A.D.
Mattingley, Sydenham, & Sutherland, "Roman Imperial Coinage", Volume 4, Part 3 (RIC), p28, nr. 129 (Plate 2, 17). Sear, D.R., "Roman Coins and their Values" (RCV 4th Revised Edition), p236, nr. 2472. Cohen, H, "Descriptions Historique des Monnaies frappees sous l'Empire Romain" (C), Volume 5, p40, nr. 186. Seaby, H.A. 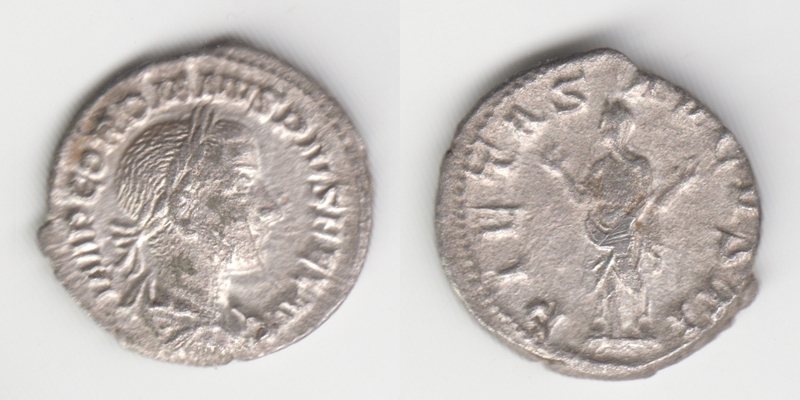 & Sear, D.R., "Roman Silver Coins" (RSC), Volume 4, p5, nr. 186. Van Meter, D., "Handbook of Roman Imperial Coins" (VM), p225, Unlisted. Kampmann, U., "Die Münzen der römischen Kaiserzeit", 2nd edition, (Kampmann) p279, nr. 72.30. Quality: Extra Fine-, with scratch on obverse starting just above Gordian's eye going down to the G in AVG.